MOSCOW, December 4. /TASS/. 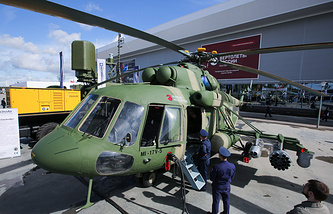 Russia has completed the implementation of a package of more than 10 contracts on the delivery of armaments to Venezuela, Deputy Director of the Federal Service for Military and Technical Cooperation Anatoly Punchuk told TASS at the Expodefensa 2017 arms exhibition in Colombia on Monday. Punchuk is heading the Russian delegation at the arms exhibition in the Colombian capital. The exhibition will be held on December 4-6. "Venezuela is the largest operator of Russian armament and military hardware in the Latin American region. The Russian side has delivered various armaments worth an impressive sum. The period of using the Russian government’s loan provided to Venezuela has ended. The Russian side has fully implemented its obligations to the Venezuelan partners. We have delivered all the armaments to the foreign customer under the contracts concluded earlier," he said. Replying to a question about when the factory for the production of AK-103 automatic rifles would launch its operations in that country, Punchuk said that this work was being carried out jointly with Venezuelan partners in compliance with the schedule approved by Caracas. "It will be launched into operation within the established timeframe," he said. As Punchuk earlier told TASS, the implementation of the package of more than 10 contracts concluded with Venezuela in 2009 was expected to be completed this year. Under the documents, Russia has delivered armored vehicles, missile and artillery armament, air defense systems and the associated military equipment, he said.